Blinds and curtains both have their own benefits for controlling light and naturally offer a variety of ways you can style them to your home décor. But it does not always have to be a choice of one or the other. With the right combination of fabrics and styling, the two can work beautifully together to complement your room or become its new standout feature. Here are some considerations to help you find the perfect look for your windows. 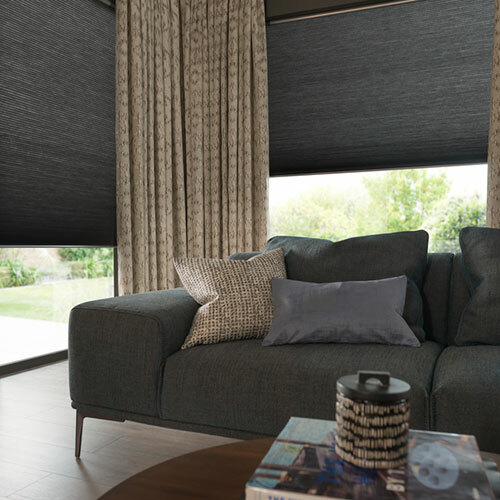 As blinds are restricted to the window space and will ultimately be what helps you control light throughout the day, it can help to start with that first. Whether you choose a classic Venetian blind as a solid colour block that can be paired with a more textured curtain. 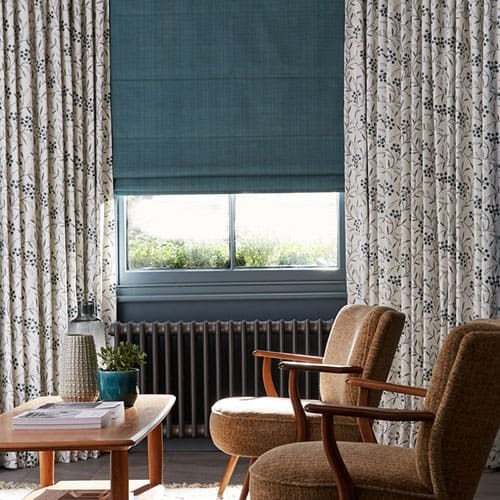 Or maybe opt for a fabric blind like the Roman pictured here, which has been paired with a plain mustard curtain so not to clash with the more eye-catching patterned blind design. Patterns are a great way to add interest to your space. 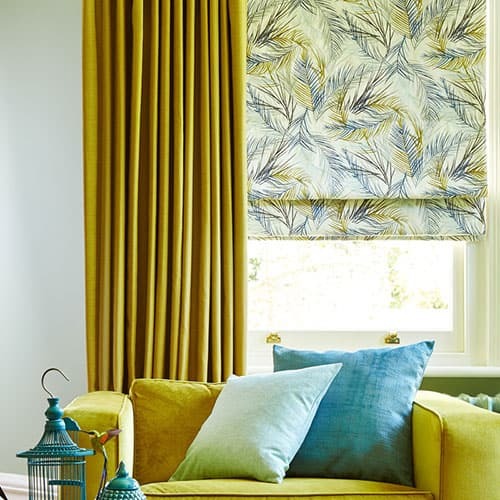 And just like the floral Roman blind pictured above, curtains can also bring a pattern into your room if they are paired with a plain coloured blind. The key is to choose a dominant colour from the pattern and match that to the plain coloured fabric. This can be more obvious like the mustard curtain, or can be a more subtle touch like how the detail in the curtains pictured here softly match the darker blind fabric. While two different patterns or prints can be paired together, you should always be careful not too let this combination overpower the room. Try to choose a bold print for your main fabric, usually the curtains, and then complement it with a softer more subtle design such as abstract prints or stripes. It is worth also considering the size of your room and what other patterned furnishings you already have. Making blinds and curtains work together does not always mean going different. If there is a single shade that really brings your interior style together, your blinds and curtains can follow this scheme and help bring the whole space together. 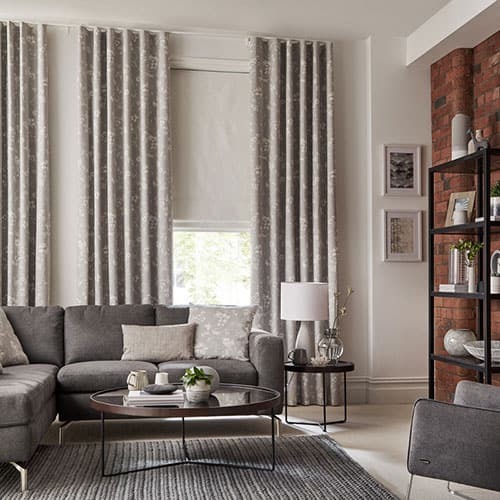 Focus more on textures or subtle patterns within the fabrics, like how the eyelet curtains pictured here match the sofa cushions, allowing your window furnishings to complement the rest of the décor and any furniture or accessories to instead grab the eye. 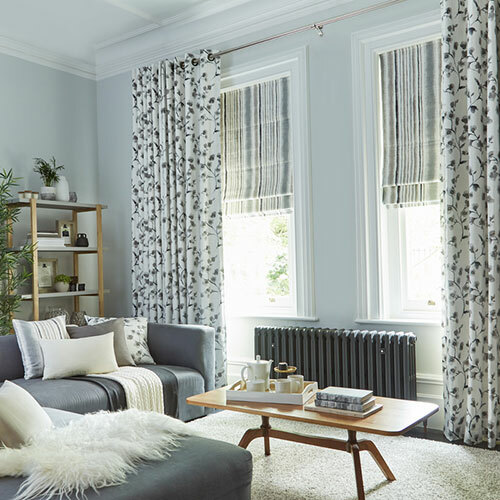 If your blinds are positioned above a radiator or across a wide area such as a bay window, dress curtains can be a beautiful touch to help frame your choice of blinds and turn them into a stunning feature. For occasions like this where the curtains will not be used functionally, adding a tieback to each side will also help create a more tailored look that should rarely need to be moved or adjusted.